Combining low doses of a toxic herbicide with sugar-binding proteins called lectins may trigger Parkinsonism—symptoms typical of Parkinson's disease like body tremors and slowing of body motions—after the toxin travels from the stomach to the brain. In a study with rats, researchers at Penn State College of Medicine found that after ingesting paraquat, a once widely used herbicide that has been banned in the U.S. since 2007, along with lectins—sugar-binding proteins found widely in nature—the animals developed Parkinsonism. According to Thyagarajan Subramanian, professor of neurology and neural and behavioral sciences and co-author on the study, the findings—recently published in the journal Parkinson's Disease—offer clues to how and why Parkinson's disease develops, and offer a model to test new medications in the future. "This study gives solid evidence that lectins, while in the presence of certain toxins, may be one potential culprit for the cause of Parkinsonism," Subramanian said. "Additionally, this animal model can be a tool in the future to continue developing new medications and treatments for Parkinson's disease." The researchers were able to track the formation and spread of a misfolded protein called alpha-synuclein, which previous research has linked with Parkinson's. "We were able to demonstrate that if you have oral paraquat exposure, even at very low levels, and you also consume lectins—perhaps in the form of uncooked vegetables, dairy or eggs—then it could potentially trigger the formation of this protein alpha-synuclein in the gut," Subramanian said. "Once it's formed, it can travel up the vagus nerve and to the part of the brain that triggers the onset of Parkinson's disease." R. Alberto Travagli, professor of neural and behavioral sciences and senior author of the study, said that while toxins like paraquat have been suspected of contributing to Parkinson's for decades, the scientific evidence was small. While paraquat was linked with Parkinsonism in previous studies, those experiments typically used high doses of paraquat that humans were not likely to encounter in real life. Additionally, lectins, which are used in medications to help deliver substances into the brain or stomach, also have been associated with certain rare forms of Parkinsonism. But the researchers weren't sure if it was the lectins themselves that were causing Parkinsonism, or if they were helping different substances get into the body that then triggered the symptoms. "Experimenting with the lectins together with the toxin makes sense, because lectins are used in pharmacology to chaperone other substances into the body," Travagli said. "So it makes sense that the two can be combined and used to make the toxicity more potent, even though the amount of toxin is very low." 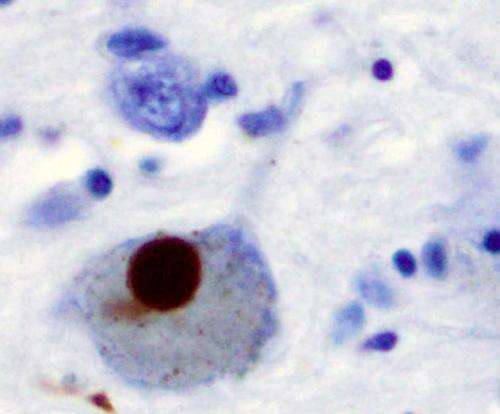 "After observing that these animals did indeed show symptoms of Parkinsonism, we wanted to double check and make sure we weren't looking at animals that had these symptoms for another reason," Travagli said. "We administered levodopa, which is a common medication for Parkinson's disease. We saw a return to almost normal types of motor responses, which was a clear indication that we were looking at some sort of Parkinsonism." In the future, Travagli and Subramanian said they will explore whether interventions in the form of diet modifications or medications that interfere with the transport of alpha synuclein from the stomach via the vagus nerve could be used to help prevent or slow the development of Parkinsonism in this rat model. This includes a natural substance called squalamine which has been shown to remove alpha synuclein from the gut and is now in clinical trials for the certain symptoms associated with Parkinson's disease.